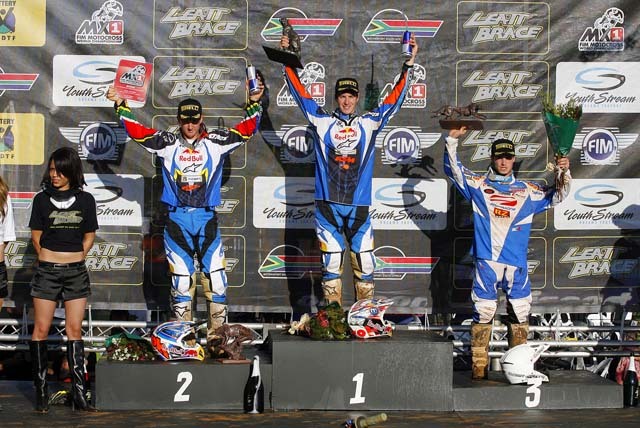 The Alkmaar Raceway at Nelspruit proved to be a great venue for the popular South African Motocross GP sponsored by Leatt Brace. Under hot weather conditions, Jonathan Barragan took his second consecutive MX1 GP win after battling it out with KTM fellow rider Max Nagl, second overall. Defending Champion Ramon completed the podium right ahead of series leader David Philippaerts. In the MX2 class Tommy Searle came back to victory from local star Tyla Rattray and Nicolas Aubin. On the other hand reigning Champion Antonio Cairoli injured his left knee and took no points, dropping down to third in the Championship with a 59 point gap from leader Rattray. Despite taking two storming starts and leading the first part of each Grand Prix moto, Red Bull KTM Factory Racingâ€™s Max Nagl was second on todayâ€™s podium behind AXO KTM Silver Actionâ€™s Jonathan Barragan. The latter secured his second consecutive win and third of 2008 by winning the final moto. After winning the opening moto, Teka Suzuki WMX1â€™s Steve Ramon ended third on the podium just one point ahead of series leader David Philippaerts of Yamaha Monster Motocross. GPKRâ€™s Sebastien Pourcel rounded off the top five from Josh Coppins as both were caught up in a first corner accident during heat one. Top five overall: 1. Jonathan Barragan (ESP, KTM), 45 points; 2. Maximilian Nagl (GER, KTM), 40 p.; 3. Steve Ramon (BEL, Suzuki), 38 p.; 4. David Philippaerts (ITA, Yamaha), 37 p.; 5. Sebastien Pourcel (FRA, Kawasaki), 33 p.
Nagl led the group into turn one and set the pace until lap 17, when Ramon took over the lead to win eventually. Nagl had some troubles in the final laps, dropping down to fourth as both Philippaerts and Barragan moved past him. Philippaerts took second from Barragan, with the Italian ending close to Ramon when the flag was waved. De Dycker rounded off the top five from Tanel Leok and Mackenzie, who made Philippaertsâ€™ life difficult in a tough fight for third. Pourcel and Coppins were eighth and ninth after a first corner crash. Nagl took another holeshot and led until ten minutes to go. Barragan made a final move on the German to take the victory and the overall, while Nagl faced Pourcelâ€™s attacks. The latter came so close to Nagl in a corner that he made a mistake to avoid a crash; Pourcel then lost ground and brought the bike home in third. Coppins was a solid fourth ahead of Mackenzie and Philippaerts, who did not find an open door to pass the Brit. De Dycker and Ramon completed the top eight. Red Bull KTM Factory Racingâ€™s Tommy Searle took his third GP win of 2008 snatching the home success from team mate Tyla Rattray. The two won one moto each, with the South African taking the final moto but missing the overall result due to a first moto crash. Ricci Racing Yamahaâ€™s Nicolas Aubin took his first season podium from French countryman Steven Frossard of CLS. KTM UKâ€™s Shaun Simpson rounded off the top five. Reigning MX2 Champion Antonio Cairoli tangled up with another rider in the first heat, damaging his left knee and dropping out of both motos after a brave try to race. Top five overall: 1. Tommy Searle (GBR, KTM), 47 points; 2. Tyla Rattray (RSA, KTM), 45 p.; 3. Nicolas Aubin (FRA, Yamaha), 38 p.; 4. Steven Frossard (FRA, Kawasaki), 36 p.; 5. Shaun Simpson (GBR, KTM), 36 p.
Aubin started strong to lead the first half of the heat from a hungry Searle. In the remaining ten laps Searle took the first place and opened up a gap from Aubin, who finished second. Rattray recovered to third after a crash and finished ahead of Simpson and Frossard. Cairoli put together just four laps before retiring. Rattray made up for moto one and took a start to flag win of the final heat in front of Searle. The latter tried to catch Rattray unsuccessfully, ending second from Frossard who secured the top three by moving past Simpson. The Brit ended fourth from Aubin. After a great start, Cairoli tried to race with Rattray but at the end of the third lap he pulled out of the race. Ramon took one point off his gap from Philippaerts as the duo are still second and first in the Championship respectively. Barragan moved up to fifth in the Championship with Pourcel dropping to sixth. Rattray is still leading the MX2 Championship with Searle second. Cairoli dropped back to third and he currently has a 59 point gap from the South African. Simpson and Aubin round off the top five. Top ten: 1. Tyla Rattray (RSA, KTM), 416 points; 2. Tommy Searle (GBR, KTM), 395 p.; 3. Antonio Cairoli (ITA, Yamaha), 357 p.; 4. Shaun Simpson (GBR, KTM), 287 p.; 5. Nicolas Aubin (FRA, Yamaha), 243 p.; 6. Rui Goncalves (POR, KTM), 241 p.; 7. Xavier Boog (FRA, Suzuki), 211 p.; 8. Jeremy van Horebeek (BEL, KTM), 197 p.; 9. Steven Frossard (FRA, Kawasaki), 196 p.; 10. Manuel Monni (ITA, Yamaha), 187 p.
New Zealander journalist Andy McGechan is the author of the new â€œJosh: flying Kiwiâ€ book about Motocross Grand Prix rider Joshua Coppins. The publication covers the early days and the latest years of the Kiwiâ€™s career and it is now available for sale. Both the author and Coppins himself presented the book today in occasion of the Leatt Brace GP of South Africa. More information on the book are available here. The first of the remaining five Grand Prixâ€™s will take place at Lommel, Belgium, on August 3. Early in that week the MX Rookie will also take place, on August 1. 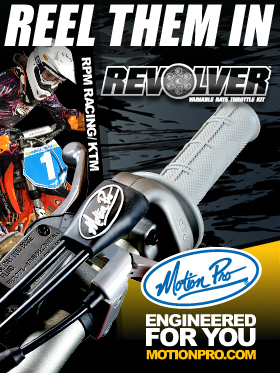 The MX Rookie is an event dedicated to all the MX2 machines mounted amateur riders; they will have the privilege to race the final on the GP circuit after a selection to be carried out on Wednesday and Thursday at a separate race track.